← August Week 3 – Colors of Collaboration. I guess the answer is “yes” to every possibility each coastal scene presents. Because here I glimpse and sing to Yemaya, Goddess of the Ocean. While I walked the shoreline the chant that welled up in me includes this phrase “Return to the home of your soul.” Think of those familiar places you return to often for regeneration, inspiration and wonderment. 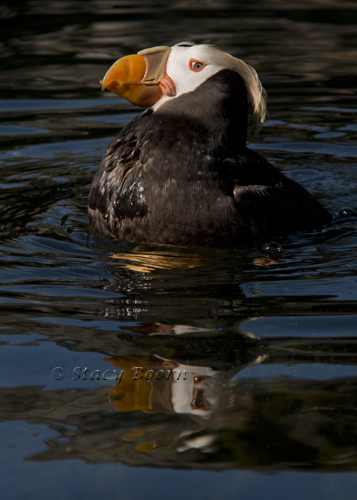 Tufted Puffin – Fratercula cirrhata. 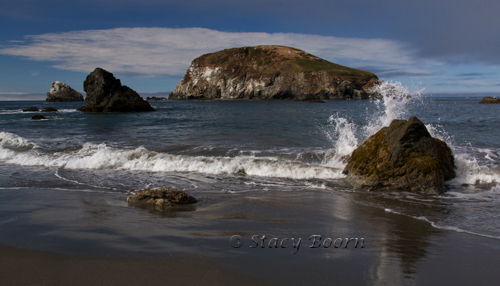 Recently I returned to Harris Beach in Southern Oregon . Harris Beach was named after the Scottish pioneer George Harris who settled along this coast in the late 1880s to raise sheep and cattle. One of Oregon ’s largest coastal islands is found here. This “ Bird Island ” (also called Sheep/Goat Island) is a National Wildlife Sanctuary and breeding ground for such rare birds as the tufted puffin. The park offers sandy beaches sprinkled with rocky outcroppings. The tide pool areas offer a glimpse of the ocean’s wide variety of life. I have only been here in summer months so I look forward to someday experiencing the beauty that changes with the seasons. There are plentiful opportunities for wildlife viewing. Gray whales are often spotted on their winter and spring migrations. Harbor seals, California sea lions, and sea birds join the rich marine gardens. When all is said and done this park is a mesmerizing stop for beachcombing, communing with Yemaya and camping. Where the Pacific Ocean breaks against rocky shorelines, you are likely to spot Black Oystercatchers who hunt about on the rocks, run along the beaches and wade in nearby mud flats. If disturbed, they take flight with loud, staccato chirping, easily heard above the crashing of the waves. 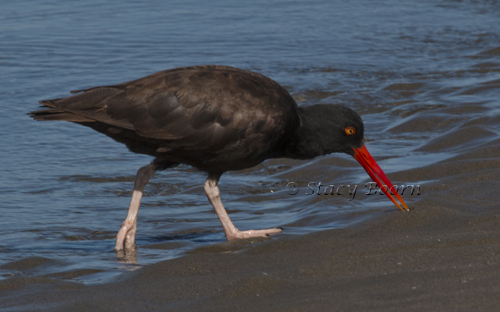 Their range stretches from Alaska to Baja, but Black Oystercatchers are scarce along the coast of southern California , where the shoreline is mostly sandy. At the water’s edge I think I heard Yemaya, a mother goddess, whisper tender tones of welcome. Like water she represents both change and constancy–bringing forth life, protecting it, and changing it as is necessary. She traveled with the people of Yoruba to distant lands, comforting them in the holds of the slave ships that took them far away from their homeland in Africa . Today she is also celebrated under many other names, including Mary, our Stella Maris (Star of the Sea). As we remember the 10th anniversary of Hurricane Katrina we are mindful of the powers of the ocean that can be both a blessing and a curse. 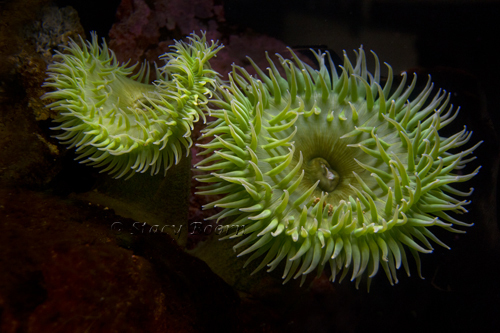 This entry was posted in Uncategorized and tagged Coastline, Giant Green Anemone, Harris Beach, Ocean, Oregon, Oystercatcher, Shoreline Photography, Stacy Boorn, Tuft Puffin, wonderment, Yemaya. Bookmark the permalink.